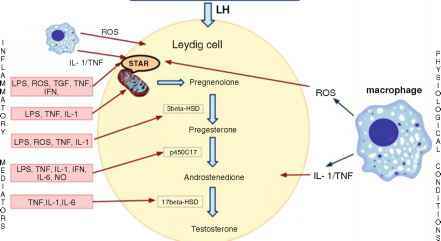 Sertoli and Leydig cells do not obviously undergo apoptosis after mild heat treatment (e.g., 43°C, 15 min), although heat stress reduces the activity of Sertoli and Leydig cells followed by changes in testicular endocrine function ,46, 47]. In somatic cells, heat treatment induces the accumulation of the HSPs and antioxi-dants, and thus leads to cell survival. Data from both bulls and boars indicate that heat stress causes an initial decline in circulating concentrations of testosterone lasting 2 weeks, but the concentrations recover even in the presence of continued heat stress [155, 156]. If left untreated through adulthood, bilateral cryptorchidism significantly lowers serum testosterone levels in patients as compared to unilateral cryptorchidism, indicating that testosterone production from Leydig cells is also impaired, at least in part, by heat stress . An in vitro experiment has shown that ROS disrupts mitochondria in Leydig cells and inhibits steroidogenic acute regulatory (StAR) protein and steroidogenesis [ 46] . Apoptosis of Sertoli cells is not observed after exposure to heat stress , whereas heat-induced germ cell death is usually accompanied by alterations in Sertoli cell morphology and function . Adult Sertoli cells have reverted to a dedifferentiated state in the cryptorchid testis, and thus lost their supportive role in normal spermatogenesis, leading to a cessation of spermatogenic activity  . After heat stress, increased expression of cytokeratin 18, liver receptor homo-logue-1 [84, 160], and intermediate filaments  and decreased expression of androgen receptor (AR), andjunction-associated proteins such as zonula occludens-1 (ZO-1) and occludin  are observed in the testis of adult monkeys and rat Sertoli cells. Sertoli cell-specific androgen receptor ablation increases permeability of the blood-testis barrier, implying that androgens regulate the permeability of the blood-testis barrier and that scrotal heat stress induces Sertoli-Sertoli cell junction disruption . A study investigating the effect of heat stress on the blood-testis barrier has shown that the biotin tracer is detected in the adluminal compartment of the testis 2 days after heat treatment; however, in the control testis, the tracer is limited to the blood-testis barrier, and no biotin is detected in the luminal compartment . Heat-induced alterations in tight-junction proteins and damage to the blood-testis barrier are transient, and they recover approximately 10 days after heat )reatment. Oxidative stress is involved in heat-induced interstitial damage. For example, interstitial fibrosis and tight-junction disruption are mediated by increased expression of transforming growth factor-beta generated by oxidative stress and are ameliorated by antioxidants [74, 164]. These findings suggest that not only germ cells but also Sertoli and Leydig cells are affected by heat treatment, and that the affected Sertoli cells lose their supportive roles in spermatogenesis.